The product works with any Forex pair. 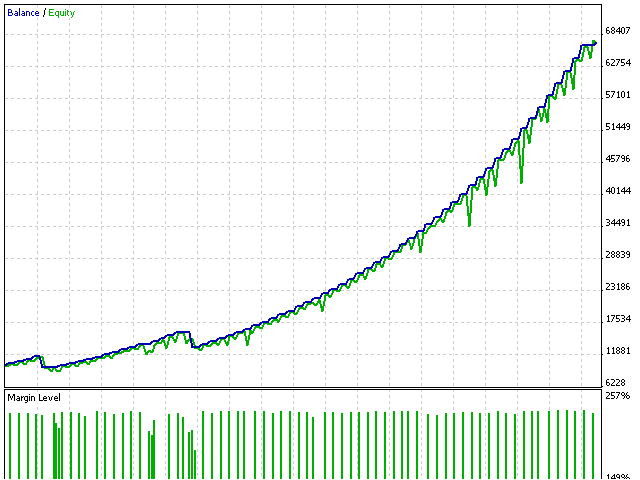 The Expert Advisor is designed for intraday trading. The signal is generated by means of the AC indicator using different combinations of signal generation according to the indicator data. Optimization is performed for one week on a minute chart. The predicted time before re-optimization is one week as well. The screenshots show examples of optimization and forecast. The first parameter (the top one when sorting by the result) is selected for the used parameter. Custom Max optimization, the EA has built-in optimization sorting progressive function. Work Period - the EA's working period. Risk - market entry risk defined as a loss percentage of the total deposit. Lot is defined relative to the stop loss and allowable losses when the stop loss is reached. LotRounding - lot rounding (to decimal places). Sleeps - waiting for position opening, closing or modifying.